Along with creating a game to Sell on The Game Crafter, or creating art to sell in the Game Design Assets section, you can also create Game Upgrades. Game Upgrades are intended to be component upgrades and fan-made expansions for mass market games. Got some new dice for Descent? They go here. Want to use our premium game pieces to make a new token set for Robinson Crusoe? Put it here as well. Board game collectors from around the world will seek them out to upgrade their favorite games. There are some restrictions when making game upgrades. 1. You can not use any logos, images, characters, or names from the original game or that contain copyrighted content. 2. You cannot make a travel version of a copyrighted game. The upgrade must need the original game to be used. 3. You can include the name of the game the upgrade is for, however, you can not include that name in any printed items with the game. After making your upgrade you can publish it to the site for sale. You can find more information about selling your games here. 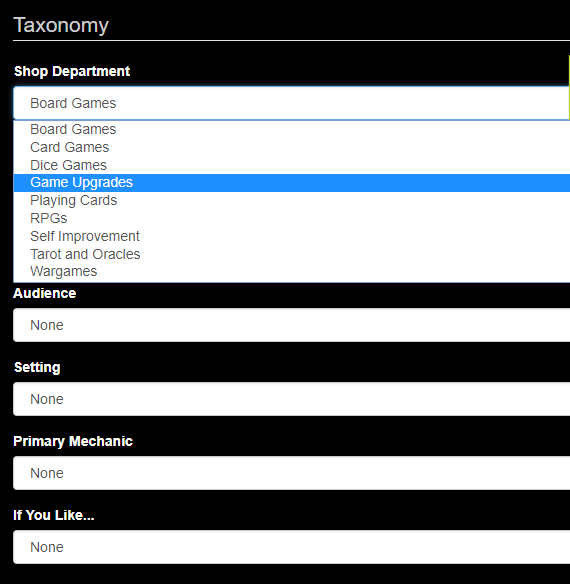 You will want to make sure you change the section Edit Details section of your game under Taxonomy to reflect that your game is a Game Upgrade.